Taking 1st place in Senior Céilí Bands competition at Fleadh Cheoil na hÉireann 2017 in Ennis, Co. Clare, for the 3rd year in a row, Shandrum Céilí Band from CCÉ, Cr. Chrónáin, Co. Cork, play a selection of Jigs - “A visit to Ireland” and “The frost is all over”. 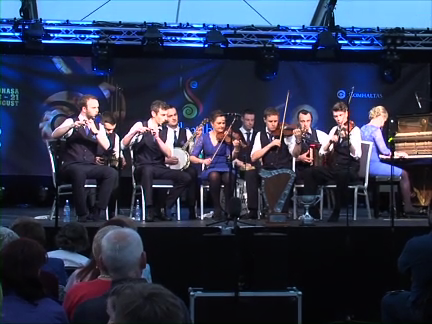 Members of the Band are Mikie O’ Gorman, Mairéad Fitzgibbon and Eddie Kiely on fiddles; Timmy Collins and Brian O’ Loughlin on flutes; Alan Finn on accordion; Tadgh O’ Sullivan on concertina; Keith O’ Loughlin on banjo; Aileen O’ Callaghan on piano and Ger Naughton on drums.